Does anyone know if Mondia sponsored any professional teams in the late 70's and if so, who were the other main sponsors? I'm on a hunt for a time specific jersey for my bike. Thank you. Welcome to the forums. Throughout the late 1970s, Mondia supplied bicycles to the Swiss based Sempione-Mondia team. Sempione was a sausage brand. 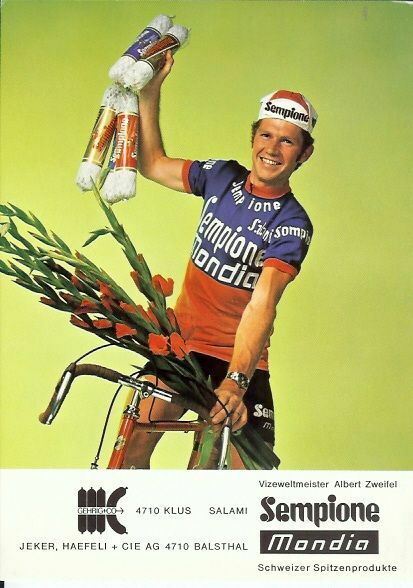 Their most famous member, Albert Zweifel, won four consecutive Cyclo-Cross World Championships for Sempione-Mondia from 1976-1979. Here's the jersey from the era. Thank you so much for the help! Now I start the search.